CHICAGO, June 5, 2018 /PRNewswire/ -- Today, CNA celebrated the official opening of its new, modern global headquarters located at 151 North Franklin Street in the heart of Chicago's Loop business district. This grand opening event marked the culmination of nearly three years of planning and construction, thousands of hours of hard work, and support from CNA employees and the City of Chicago. 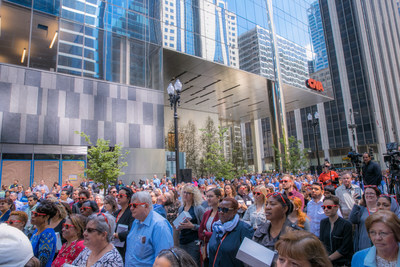 At the event, hundreds of CNA employees filled North Franklin Street to hear celebratory remarks from CNA's Chairman and Chief Executive Officer, Dino E. Robusto; City of Chicago Mayor Rahm Emanuel; and The John Buck Company (JBC) Chairman and Chief Executive Officer, John Buck. 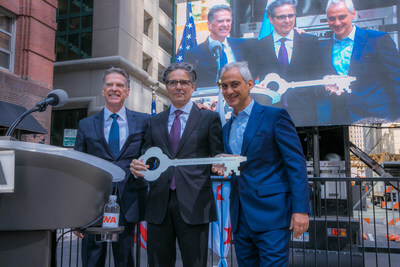 "CNA's new global headquarters is more than a symbolic reflection of the evolution of both the organization and Chicago, it is a prime example of the imperative to modernize, to transform, to evolve, and to innovate so that we grow with purpose and provide our clients with the best possible support and service," Robusto said. "Chicago's unrivaled economic dynamism gives leading companies like CNA the tools and talent they need to thrive in a competitive, fast-paced global marketplace," Mayor Rahm Emanuel said. "I'm proud CNA is reaffirming its commitment to Chicago and look forward to their latest insights, innovation and growth as they continue to drive the finance and technology industries." "JBC and Morgan Stanley are excited to welcome CNA as the lead tenant to 151 North Franklin Street," Buck said. "After over 45 years in the Southeast Loop, now CNA employees will experience the Northwest Loop. We commend architect John Ronan's creativity and hope that all concerned will enjoy officing in this fine building."